"It was a headless horseman!" "You must not excite yourself..."
"But it was a headless horseman!" "Of course it was. That's why you're here." "No, you must believe me. It was a horseman... a dead one... headless!" "You don't know because you were not there! It's all true!" "Of course it is. I told you... everyone told you." You've come upon It was a horseman... a dead one. 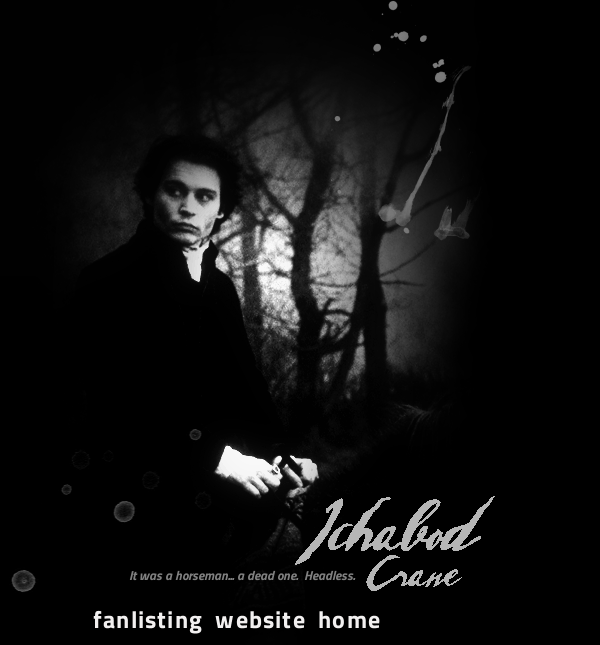 Headless., the Listed Fanlisting for Ichabod Crane (Sleepy Hollow) in the Characters: Book/Movie category. My favorite version of the character is the one Johnny Depp brilliantly and amusingly played in the 1999 film. Are you an Ichabod Crane fan too? Then be sure to join! This fanlisting is owned by yours truly, Jennifer. This site is all fan based. I don't know Johnny Depp or anyone involved with Sleepy Hollow and I don't own any images used in the making of this site. If you have any concerns, feel free to write me.